Tel Aviv is one of the most youthful and cosmopolitan cities in the world, with one in three inhabitants aged between 18 and 35, and over 100,000 students at more than 20 universities and colleges. Having lived near orthodox Jewish areas of north London for most of my life, this vibrant, creative and youthful energy was something I had not anticipated, but I was pleased to experience it first-hand. On a Friday afternoon, bar-hopping in the streets of Tel Aviv was not how I envisaged spending my first ever Sabbath before coming to Israel - another misconception bites the dust. But what a great afternoon that was, accompanied by local mixologist David Hirschfeld and a number of new Israeli friends. Yes we did break bread (the Israeli plaited bread, challah which is a fixture in many homes over Sabbath), but this was accompanied by a delectable selection of dishes, and plenty of arak spirit at the lovely Pimpinella, an arak & fish bar in the trendy Levinsky Market district of Tel Aviv. Our second stop was at the nearby Saluf & Sons, a new bar and restaurant serving a modern take on traditional Yemenite Jewish fare - think meaty soups and creamy hummus. 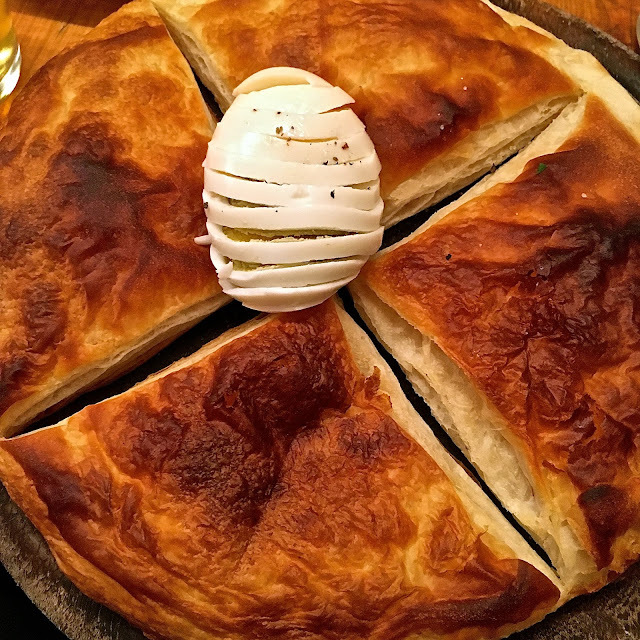 It also had the best fluffy malawach I tried on this trip – a fried bread that resembles a thick pancake, consisting of thin layers of puff pastry brushed with oil and cooked flat in a frying pan. Tables are communal with an emphasis on the Israeli concept of ‘chamara’ whereby people sit together, eating and drinking for hours. And here is where I learnt of another endearing local Israeli custom - their love of shots. So don’t be surprised if you are offered from time to time a complimentary shot of Arak, Campari, vodka, you name it, just shout ‘L’haim’ (cheers!) with gusto and down it in one. Shishko is a Bulgarian Pub on Mount Sinai Street, and is also one of the busiest bars in town during Shabbat, if my visit is anything to go by. I slightly lost the plot at this place with the countless number of locally distilled gin, whisky, and brewed beers I consumed. The place was heaving with a young Tel Avivian crowd kicking off their Shabbat weekend. In a country the size of Wales where land and resources are scarce, entrepreneurship and hard work are much prized, but at the weekend the locals certainly know how to let their hair down. I was told that the food and drink scenes in Tel Aviv were comparable to any major European city, and from what I experienced during my week there, I have to agree. Dalida Restaurant also in the trendy Levinsky Market district of Tel Aviv, attracts a young and affluent crowd every day of the week. Dalida is always packed and reservations are a must – we ate here on the first day of our Vibe Israel Food Tour, but I returned to this restaurant with Dr G in our own time once the tour was over. The eclectic menu by the chef and owner Dan Zuaretz is mostly Levantine with European and Japanese influences, offering a range of different sized portions perfect for sharing. 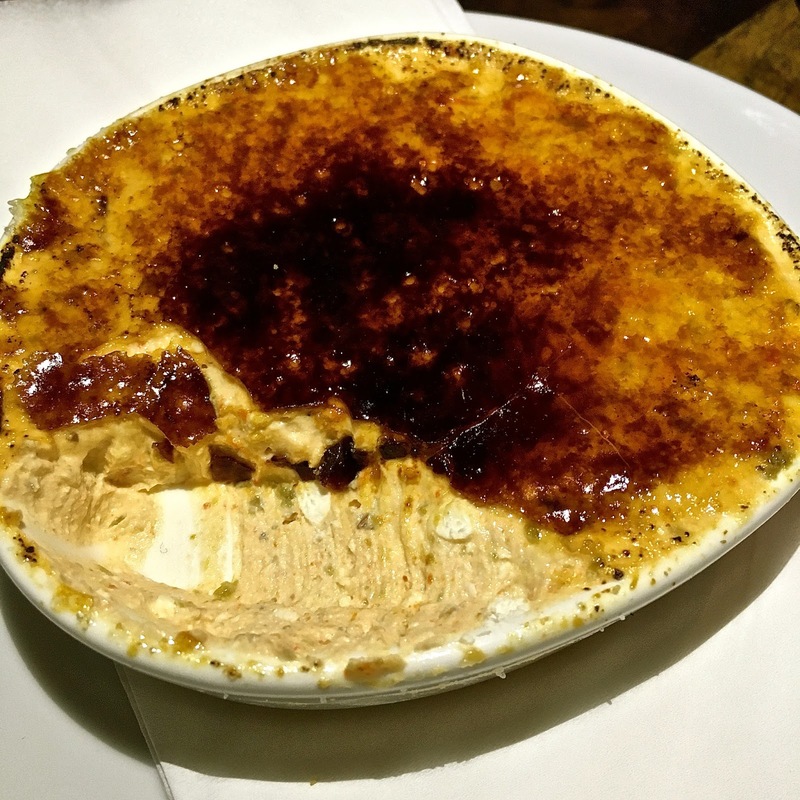 One of the outstanding dishes on our visits was their ‘spicy feta crème brûlée’ – this was creamy, sweet and spicy all at once, the flavours of salty cheese and burnt caramel is a combination I will not forget easily. The Israeli-style sashimi of thin slices of sea bream seasoned with olive oil, lemon, chillies, ‘freekeh’ (smoked wheat) and a mix of Egyptian spices known as ‘doa’ (coriander seeds, peanuts, chickpeas, dry mint leaves, sesame seeds and salt) was creative and an entirely new way (or at least to me) of serving a sashimi-style dish. I also enjoyed Dalida’s raviolo of chicken wing meat and goat yoghurt, with chicken broth, charred courgettes, cress and grated yoghurt cheese. This was my first taste of goat yoghurt cheese - I love finding new ingredients on my travels and introducing them in my cooking back home. Another winning dish was their French toast served with bone marrow in a richly flavoured beef and hibiscus stock, caramelized chestnuts and Jerusalem artichoke cream. The food at Dalida was creative, the flavours bold but fresh. 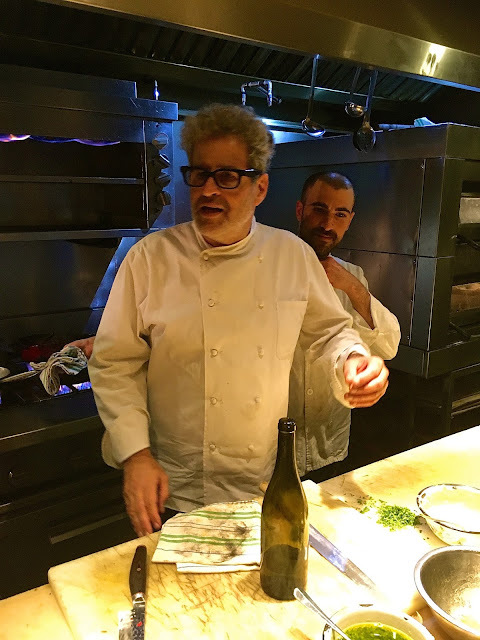 North Abraxas is one of 9 restaurants by local celebrity chef Eyal Shani. We had a magnificent (if slightly crazy) dinner here and were lucky to meet the chef himself on the night. Eyal Shani is a judge at the Israeli Masterchef TV show and is said to be a real poet when talking tomatoes! Of the many great dishes we had at North Abraxas, the one that struck me most was Shani’s burnt cauliflower. I had a brief interview with Eyal Shani who shared this recipe with me - I will be featuring it in a separate post in the coming weeks. Shani's meltingly tender spinach with butter and Parmesan cheese and roasted calamari in a spiced tomato sauce were also outstandingly good. 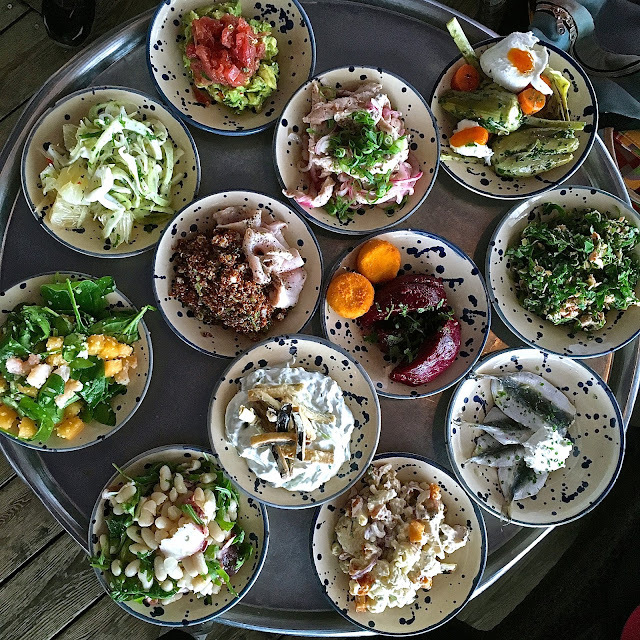 Few restaurants have impressed as much as North Abraxas on this trip – the atmosphere, the food, the quality of ingredients and the super friendly service all made for one of best evenings of our Vibe Israel food tour, and I highly recommend it to anyone visiting Tel Aviv. From North Abraxas, we left for Aria Restaurant & Bar. 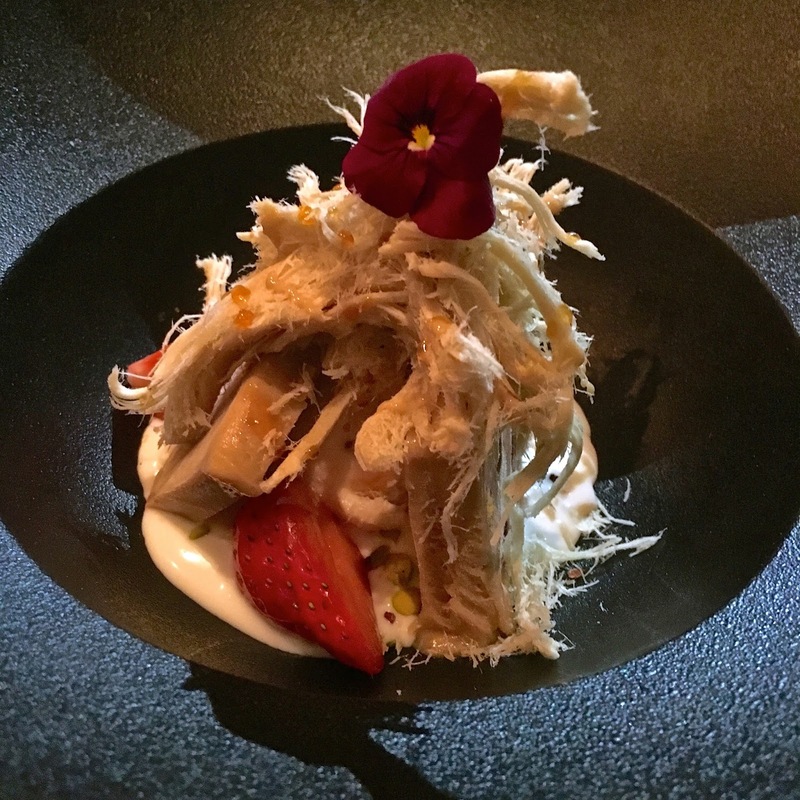 I must admit, I didn’t get to try the food at Aria (I had eaten so much at North Abraxas), but the dishes that were brought out to us looked stunning and I made a mental note to come back to it on my next visit to Tel Aviv. On the ground floor, Aria is a large bar and club - I could not believe how jam-packed this place was considering it was rather late on a Sunday evening - the first day of the working week for the Israelis! A nightcap was in order and so we headed to the Bell Boy Cocktail Bar in the trendy Hotel B Berdichevsky, a stone’s throw from Rothschild Boulevard. Opened as recently as 2 years ago, this hotel and cocktail bar is gaining a steady following with some claiming it to have the best cocktails in town. Messa is a very elegant restaurant headed by chef Aviv Moshe. Here I had one of my favourite desserts on this trip – a fantastic halva parfait with coconut cream, rose water, pistachio nuts and strawberries, topped with halva ‘hair’. It was nutty, creamy but also refreshing from the parfait and strawberries, a real play in textures and flavours. But without a doubt, my very favourite restaurant in Tel Aviv was Manta Ray – I liked it so much I went back there for another meal once the tour was over. Ofra Ganor is the charming owner, and the kitchen is headed by Ronen Skinezes. Manta Ray has a wonderful sea front location, and the fish and seafood are the best – fresh and expertly cooked. The restaurant is famous for its generous selection of meze which is brought to the table and diners pick the dishes they want. These included squid with grapefruit and fennel, tzadziki with tempura aubergine, cured yellowtail with pickled onions, and tabbouleh. We sampled most of the menu, but for me the highlights were the fillet of grouper on mashed blue potatoes with shallot flakes (which looked and tasted stunning), and a delectable dish of scallop and shrimp on fennel cream, topped with diced bacon, shallots and apples. Best of all, however, was the risotto of prawns, calamari and chicken with Manchego cheese and macadamia nuts – this was the reason why I went back to Manta Ray. Shamelessly, I asked Ofra if she would let me have the recipe for this risotto, and happily she did. At the Tel Aviv Port Farmers Market, a great place to discover and buy some of the best produce of the region, we also had a delicious lunch at the Kitchen Market restaurant. What struck me about this restaurant was not only the delicious dishes we had but also their exquisite, creative presentation. Take for example their beet and fish salad, with thin discs of beetroot, interleaved with dill sprigs over hazelnut and yellowtail sashimi. It was fresh, beautifully presented, and a real delight to eat. But what to do between meals in Tel Aviv? Tasting Israeli wine of course – Israel is a major wine producer in the region where wine has been made and consumed for thousands of years. At the Tasting Room, in the Sarona complex near Sarona Market (see below), this wine bar and shop is a place where you can try more than 40 different types of Israeli and international wines using the latest enomatic machines. Similar in concept to The Sampler or Vagabond in London, visitors can pre-load a card with credit and then navigate a wide range of wines from the region and beyond trying 25ml tasters before committing to a whole glass or bottle. It was good visiting the Tasting Room early on our trip to Israel - I tried quite a few wines here and was then able to buy some of these bottles during my time in the country. I can’t think of a better way to sample such a range of wines so conveniently. Two other foodie places not to miss are Sarona and Carmel Markets. Sarona Market is situated on the ground floor of a luxury complex of apartments. More like Harrod’s Food Hall than a market– it is air conditioned, and frequented by the well-heeled crowd of Tel Aviv. With 91 shops of all categories from fishmongers to halva specialists, fruit sellers and craft beers, as well as stalls and restaurants, Sarona Market is Israel's largest indoor culinary market and operates seven days a week. It is a great place to spend a few hours browsing, sampling and hob-nobbing with the foodie in-crowd. At the other end of the spectrum is Carmel Market. 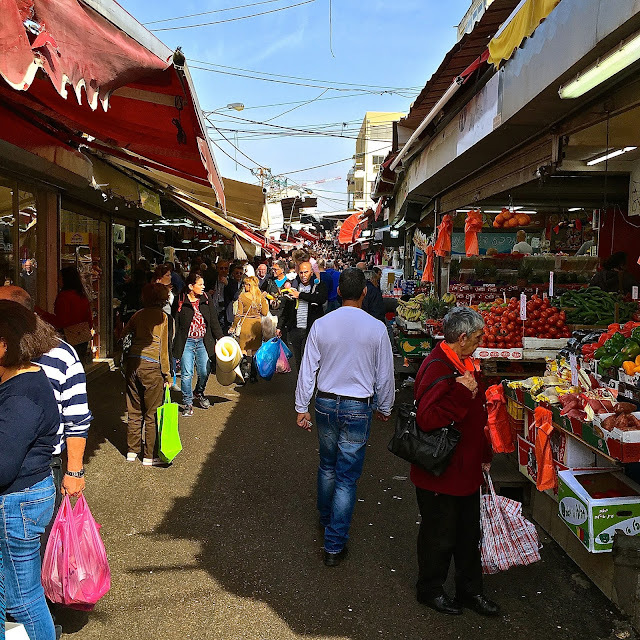 This open-air market is lively, traditional and authentic, and during our visit was heaving with locals making purchases of essential foods for the Shabbat. 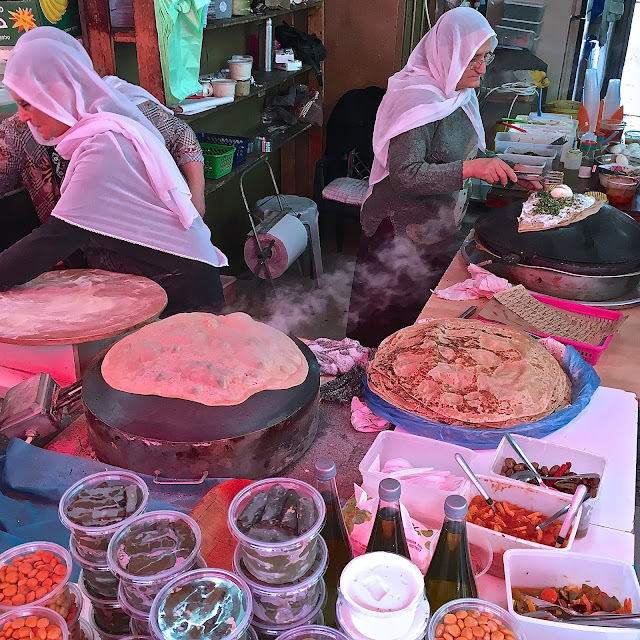 Also known as Shuk HaCarmel, here you can sample from a huge range of street foods, and buy everything from hand-made Druze pita (a traditional flat bread cooked fresh, then filled and folded) to boutique cheeses, salted fish, cured meats, local-roasted coffee, fresh-pressed fruit or vegetable juices. The ancient and biblical town of Jaffa (Yafo), now one of the two municipalities of the city of Tel Aviv-Yafo, can be seen at the end of Tel Aviv’s beach-side promenade. It’s a beautiful spot with meandering cobbled streets, art galleries, boutiques and chichi cafes and a rich history dating back over 5,000 years. It is mainly Arabic rather than Jewish, and over the last 10 years has undergone a thorough, but still ongoing process of gentrification. Jaffa is a charming place, with its mixture of historical buildings, buzzing bars and antique shops. Artists flocked to Jaffa as it was one of the few affordable places to live near central Tel Aviv before property prices rocketed over the last few years. It has however still maintained its creative and bohemian feel, and is home to a huge flea market (also known as Shuk HaPishpushim flea market). This is located next to the Old Clocktower in Jaffa on the streets of Yefet, Yehuda Margoza, Amiad and Beit Eshel. Open daily from 9am-5pm, or 2pm on Fridays, but closed on Saturdays. Tel Aviv-Yafo was one of the most exciting cities I have visited lately – for delicious Israeli and Arab food, vibrant nightlife, and great local wines, not counting the 14km of white sandy beaches, this is a city I cannot wait to return to. Thanks to Vibe Israel for inviting me on their Vibe Food Tour 2016. This extends the full length of Carmel Street. I'm so glad that you loved Tel Aviv. I'm Jewish and I have family living in Tel Aviv so I've visited several times and I absolutely love the food. I've been to Massa and I agree it's very elegant with great food. But for me Tel Aviv is all about places like Manta Ray (also my favourite restaurant) where you really have the vibe of the place and the gorgeous fresh seafood. For next time you go I recommend La La Land, for fish right on the beach with your feet in the sand, and Aladdin a gorgeous restaurant on a hill top in Jaffa. Oooh and all the frozen yogurt, it's the best I've ever had! All of that food looks incredible! I'm so ready for some hummus and challah now. Haha, happen to studied Bulgarian back in time - Shishko means Fatty guy :) It truly looks like a delicious journey! Fabulous write up. I long to visit Israel. Sadly we had to decline a wedding there this year, but one day I hope to visit and sample first hand all these amazing markets and restaurants.